It was the California State Assembly’s turn to review the recent State Smart Transportation Initiative (SSTI) report on Caltrans at a Transportation Committee hearing Monday. The discussion played out along the same lines as the Senate Transportation Committee hearing last month, where Professor Joel Rogers, who led the team that produced the report for the California Transportation Agency (CalSTA), presented his findings on the dysfunction at Caltrans. 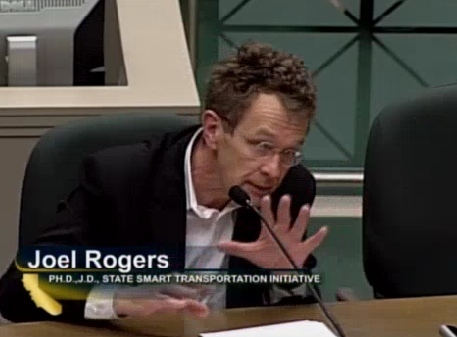 Rogers drew questions from committee members when he cited the lack of coordination between local transportation planning agencies and Caltrans. Rogers skewered both Caltrans and the legislature in much the same words he used in the recent Senate hearing, where he criticized Caltrans for its “hypertrophic aversion to risk” that prevents it from being an effective partner. This time he evoked an appreciative, if sheepish, laugh from the committee members when he remarked that they had a hand in making Caltrans the dysfunctional organization it is today. Two committee members, Assemblymembers Tom Daly (D-Anaheim) and Katcho Achadjian (R-San Luis Obispo), seemed eager to move reforms along. “What’s our plan of action? How can we be involved?” asked Daly. CalSTA undersecretary Brian Annis promised that follow-up. Within two weeks, a vision statement will be completed for Caltrans, he said. This is the first step in the report’s Early Action Plan, a set of recommendations from the SSTI team for short-term actions to get reform moving. CalSTA is also moving forward on the second step, forming eight teams to develop performance measures and action plans. Each team will be headed up by a CalSTA staffer, although team compositions have not yet been finalized. The eight areas of focus are: Performance-Based Management, Smart Investment, Design Manuals and Guidance, Strategic Partnership, Innovation and Risk, Human Resources, and Communication. 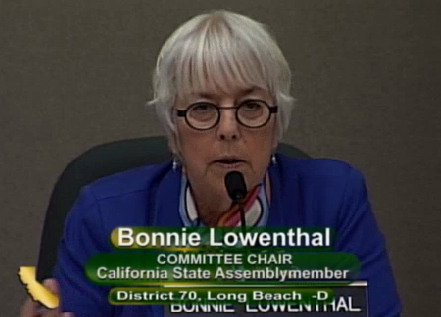 Committee Chair Bonnie Lowenthal (D-Long Beach) applauded Caltrans for inviting input on how it can improve its policies and practices. “Asking others to publicly critique one’s own operations certainly takes guts,” she said. But since then, “We have been bypassed by the rest of the country where cities and states have allowed much more innovation and experimentation, and now it’s known how to design good bike facilities,” said Cohen. Out with the old, and in with the new. If our taxpayer funded agencies are not going to serve our needs with 21st century modes of transit, they must go. If they are found to be engaging in corrupt practices,they must be FIRED,yes FIRED,and in some cases stripped of their pension benefits. We need to get the bad apples out of the orchard. Toll roads too, are a bust. Taxpayers already pay for roads to be maintained, and built. We own all of the equipment, pay for the labor, and our taxes buy the materials. WE SHOULD NOT HAVE TO PAY TO USE THEM! Beware the dreaded Public Private Partnership. Beware of the TOLL TUNNEL TO DISASTER. It’s loathsome to make taxpayers foot the bill for inept decisions. DO NOT VOTE FOR MEASURE J. If you do it will be like buying booze for a man with a really bad drinking problem.